Although many Arabian horse enthusiasts grow up involved in the pursuit of fun on the back of a horse, or studying pedigrees far into the night, Bruce grew up in Newport Beach in Southern California, juggling his spare time between swimming, water polo, body surfing, and sailing. While serving as an officer in the US Navy, Bruce married ex-wife Diana and found her dowry was an avid interest in Arabian horses. Bruce’s interest has grown since Diana purchased her first Arabian horse in 1981. Bruce shared his ex-wife’s passion, and the Johnsons bred and raised Straight Babson horses on a pasture oasis in tBuckeye, located west of Phoenix, Arizona. 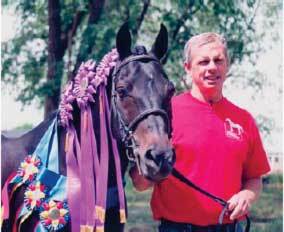 Charles Craver said you have to prove your horses, and that led to Bruce explore the Show Ring starting with Dressage. Jackie Alkin was selected to train Ibn Sabbah Bedu and she quickly moved him up through the levels from First Level in 1995 to a 5th place finish at the US Nationals in 2001 in Prix St. Georges. Sabbah was the first Babson stallion to win the Arabian Horse Association’s Legion of Supreme Honor and Legion of Excellence Awards. The Johnsons campaigned Sabbah for years in both the Arabian circuit and in Open Dressage shows to prove that a Desert Arabian horse could compete successfully in today’s show ring. After successfully competing in Jumping, Dressage and Sport Horse, and after earning five US Nationals Top Ten awards in four events, seven Regional Championships and seven Regional Reserve Championships in six events, Sabbah was retired back to Buckeye. Sabbah’s replacement in the show ring, Ahmed Fabo, teamed with Jackie to win the USEF’s 2003 Horse of the Year Award for Region 7 Dressage. Bruce’s goal is to make a positive contribution in all his endeavors. Bruce started by volunteering to put on local schooling shows followed by positions on the board of his local Arabian horse club. This led to more show management experience at the third largest class A Arabian show in Region 7 and another “opportunity” in running the Performance Division (Dressage, Hunter Jumper and Sport Horse) at the Region 7 Championships since 1998. Other volunteer work included Al Khamsa, Inc., a preservationist organization where Bruce served on the Board of Directors, two years as president and five years of experience in developing multiple issues of the Khamsat magazine. Bruce’s performance in his volunteer efforts drew the attention of the leaders of the Arabian Horse Association, and he has since served as Chair of their Business Technology Advisory Committee and the ad-hoc Strategic Planning Committee. Bruce was awarded the AHA President’s Award as the top AHA Volunteer in 2013. Bruce is currently a commissioner on the Arabian Horse Association’s Registration Commission. He served for many years as a Trustee of the Arabian Horse Owners Foundation and a trustee of the Purebred Arabian Trust. He has served as Vice Chair and Chair of the Board of Directors of the Institute for the Desert Arabian Horse. Bruce resides in Clermont, Georgia, where he restores air-cooled Volkswagens and examines the design, development, and tactical employment of German armored vehicles during the span of WW II.